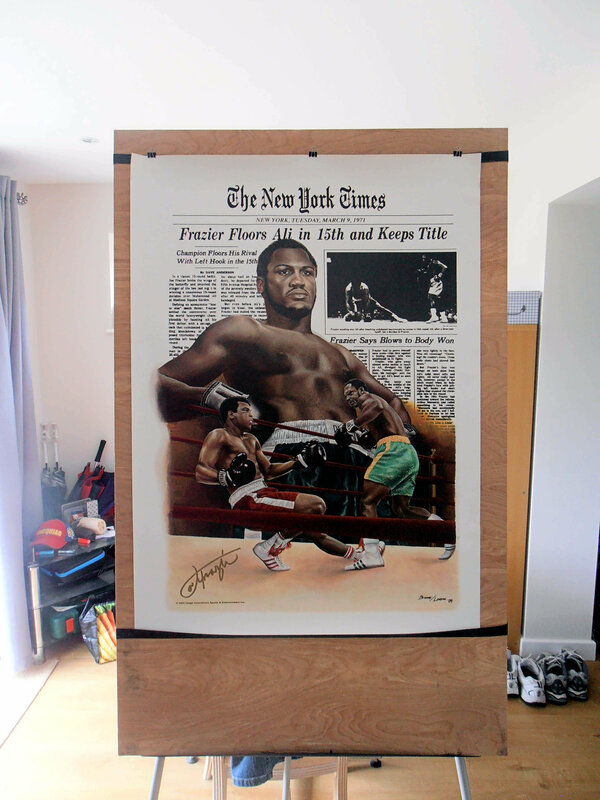 Description : We have here an art canvas by 'Broome & London' depicting the morning after New York Times headlines from the previous evening when Joe Frazier handed Muhammad Ali his 1st ever loss as a heavyweight. 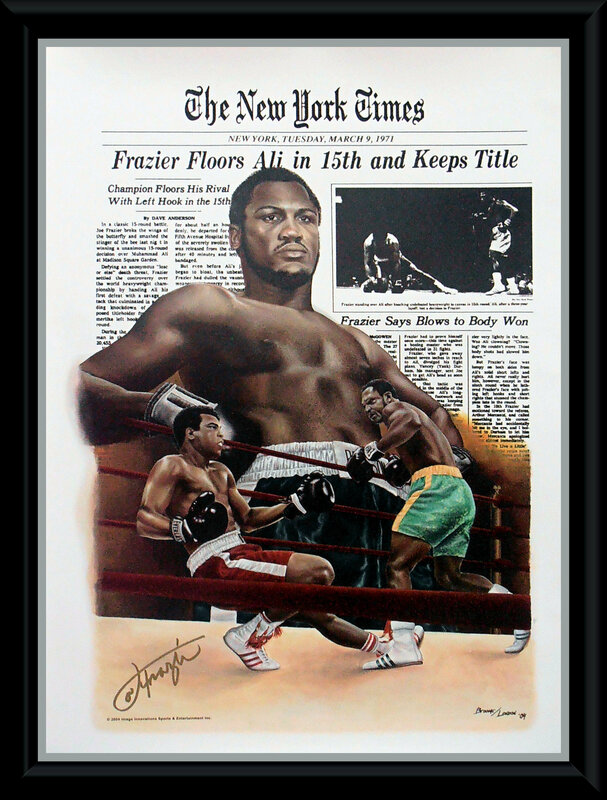 This art canvas was produced in 2004 & has been signed by the late & great 'Smokin Joe Frazier. The fight was billed as the 'Fight of the Century' (FOTC), the whole world held it's breath as to the outcome of this titanic battle between two absolute polar opposites. The fight became an extension of the strife that existed within the country, as Ali had become a symbol of the left-wing anti-establishment movement during his government-imposed exile from the ring, while Frazier, as a matter of convenience, was adopted by the conservative, pro-war movement. According to the 2009 documentary Thriller in Manila, the match, which had been dubbed "The Fight", "gripped the nation, but also split it down the middle. If you were rooting for Ali you were black, liberal or young, against Vietnam and for the Civil Rights movement. If you backed Joe Frazier you were a representative of white, conservative America." The Fight was one of the most anticipated events of the 20th century, and transcended boxing. 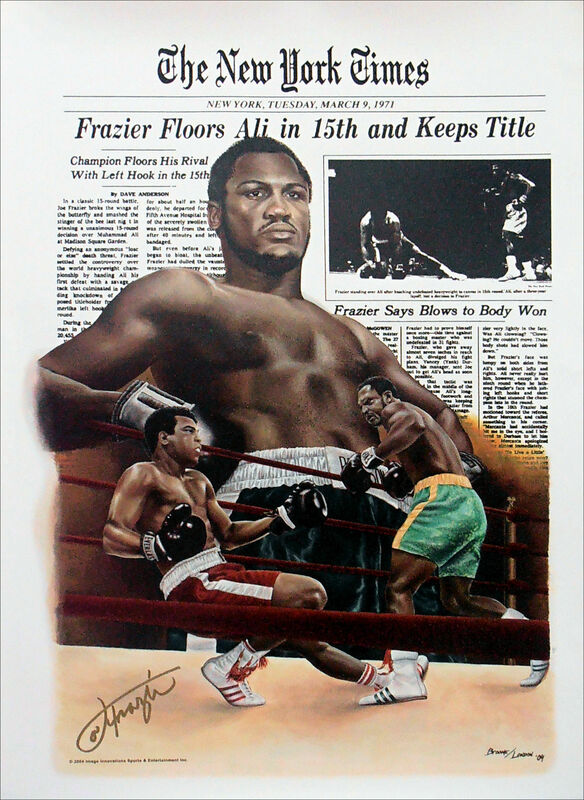 This authentic Joe Frazier autographed art canvas by Broome & London is accompanied with a lifetime guarantee of authenticity from KOfightposters.